Despite the deep financial losses, its stores looking like ghost towns, and unprecedented backlash by consumers, Target appears content with its sprint into self-destruction. Target’s leadership problems are so deep, stockholders are questioning whether or not the company is in qualified hands. So much so, it has recently fired five top executives and has slashed CEO Brian Cornell’s pay by one-third. While AFA’s boycott is focused on Target’s bizarre and dangerous dressing room and bathroom policy, the company has a history of distaste for traditional family values. For example, Target has abolished “boys” and “girls” signs from its toys and bedding departments in an effort to remove references to gender. On multiple occasions, Target has supported state and national legislative efforts that would force Christian business owners to violate their religious convictions. 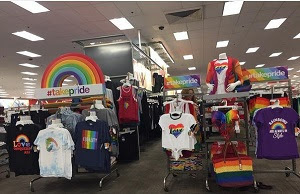 Then, there’s Target’s all out love affair with the LGBTQ. For the past two years, Target stores have entire sections dedicated to products normalizing homosexuality. In many instances, profits from the sale of the products are donated to gay advocacy groups for the promotion of the lifestyle to children in public schools. Most effective: Make a personal comment on Target’s Facebook page here. Call your local manager and politely remind them that you are still boycotting Target. Find your local Target store number here. On May 23, I will hand deliver more than 500,000 signatures to Target’s corporate headquarters in Minnesota. These signatures are in addition to the one million I delivered to CEO Brian Cornell less than a year ago. 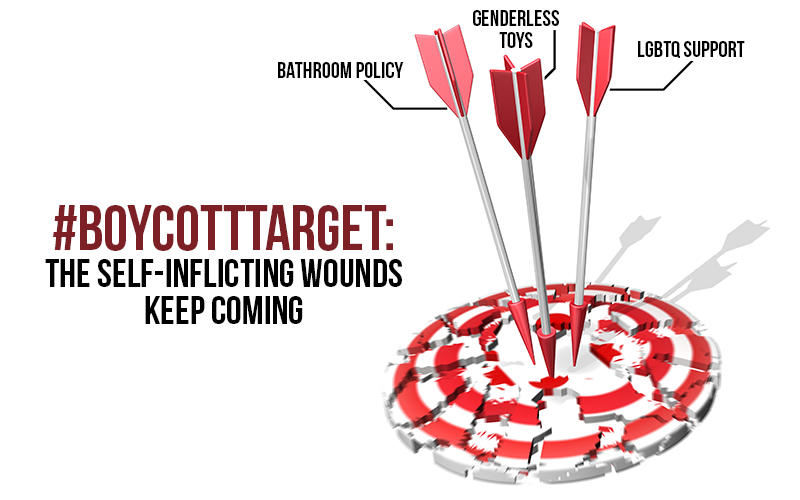 Pray that Target’s leadership will realize it gravely misjudged the 1.5 million families who have signed a pledge to boycott its stores for allowing men to enter women’s dressing rooms and restrooms. 12/22/2016: Thank you! HB2 was NOT repealed. Thanks to the efforts of supporters like you and other citizens in North Carolina, House Bill 2 (HB2) was not repealed by a vote of 32-16! This is a major victory over the efforts of the radical homosexual agenda to repeal HB2. HB2 serves as a legal barrier liberals want removed because it prevents the passage of so-called “comprehensive non-discrimination protection” city ordinances, like the Charlotte ordinance that allows men who “think” they are women in women’s restrooms. But thousands of North Carolinians like yourself sent emails and made phone calls to their elected officials strongly urging them NOT to repeal HB2; they listened and heeded your call. But not all republicans voted to keep HB2 from being repealed! Actually, 16 NC republican senators fought for the homosexual and lame duck Obama administration’s agenda. Pathetic. Here’s a link to a list of these republicans that voted not to protect women and children from sexual predators in public restrooms and dressing rooms. These 16 senate republicans followed the liberal’s argument that since the Charlotte city council passed its Dec. 19 resolution allegedly repealing their unconstitutional, child endangerment ordinance, that HB2 was no longer needed and be repealed. But reports indicate that the Charlotte council intentionally misled both the general public and NC legislators that the ordinance was fully repealed. It was not. The legislature soon became aware of the alleged deceptive acts of the Charlotte council, but the 16 republican senators remained in lock-step with the liberal agenda to repeal HB2. The legislative body was also made aware of the intentions of homosexual activist groups, like Equality NC. Their agenda was to put in place the very liberty killing, child-endangerment ordinances that the Charlotte city council said they repealed. Their agenda was made clear on MSNBC the night before the Wednesday special session to vote on repealing HB2. Homosexual activist Chris Sgro, Executive Director of Equality NC, said on MSNBC they wanted to accomplish three things: elect a pro-equality/homosexual governor (which he said they now have in Gov-elect Roy Cooper), pass city ordinances enacting comprehensive non-discrimination protections (this is code for allowing men into women’s restrooms and dressing rooms), and to repeal HB2. You can watch the MSNBC video here and see for yourself (apologies for low video quality) what the homosexual activists want to do if NC citizens ever allow their legislators (like the 16) repeal HB2. So, even though pro-family, conservatives can celebrate victory today, they will be back in the 2017 NC legislative session to twist arms in order to get their radically liberal agenda advanced by repealing HB2. Stay connected with us and well keep you informed.